You may have seen that we had a shell made for us in the UK, it was made of wicker-work by a local artist. It was environmentally responsible and beautiful. Once we got here, however we saw that it would not be able to take the kind of beating it would be expected to in the monkey bus from place to place. So we decided to see if we could get one made in Morocco that could take more abuse. We went to a few different stalls that sold weaving but all their products were either made elsewhere or they were selling to the trade rather than making. Ahmed had the idea of seeing if we could make it out of leather, over a wooden frame. 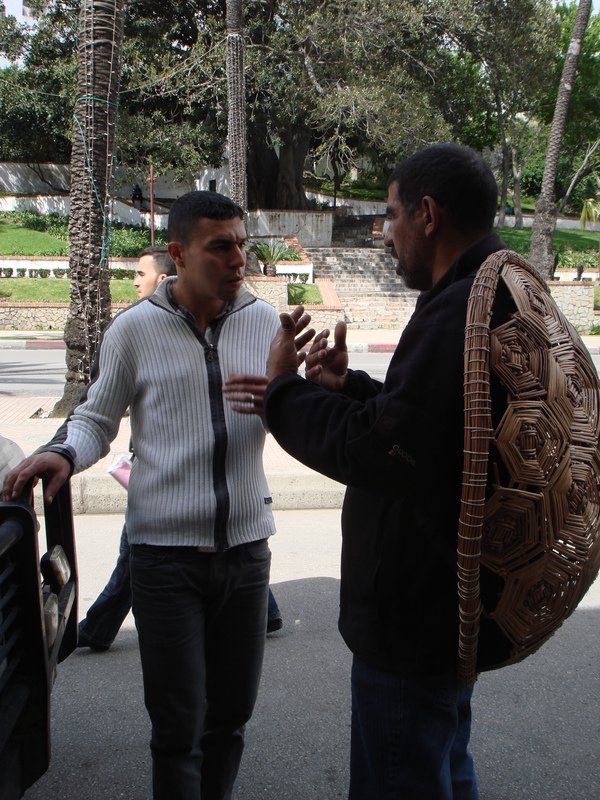 We went down to the Artisan Centre and spoke to the leather-workers there and after some long conversations which made us giggle with Ahmed wearing a shell having a completely serious chat with the worker as though there was nothing amiss! Ahmed then set about making the frame by bending a pole to a shape and then attaching strips that curved to this. When we left it wasn’t finished but I am looking forward to seeing photos once it is done. I think in total it cost around 20 to 50 Euro. I love the shell made in the UK. Did you get to bring it home? We are bringing it home. You are currently reading How the tortoise got his shell, oh Best Beloved at monkey unmasked.